Most Mondays, I buy lunch and sundries for the week at Krogers. It usually comes to about two plastic grocery bags' worth, which means I actually get four plastic grocery bags. 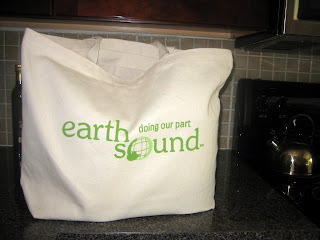 Yesterday I took the plunge and bought my first reusable grocery bag. Canvas grocery bags always seemed like an easy, "low-hanging fruit" kind of way to help out with the home planet. In this case, it made perfect sense due to the low volume. I heard you can get a nickel for every reusable bag you use at the checkout line. Gee, thanks Krogers. If I could possibly fill up 10 bags, I could get a whopping $0.50 back. Definitely don't do this to save money. Anyway, of course, when I checked out, she actually put the canvas bag inside a plastic bag, along with my other stuff before I noticed. I guess it will take some getting used to for both parties. UPDATE: I knew I read that part about getting a nickel back somewhere. Apparently, they've done this for 15 years. I'm taking bets on whether any cashiers in any stores know this. I go to Bigg's in Hyde Park as well as Keller's IGA on Ludlow and most people have reusable bags. Yep, it's getting more and more common, but I still get blank stares pretty often. Part of the trick of bringing your own bag is to boldly pronounce it before the check-out person starts doing their things. I've noticed that check-out professionals are trained to quickly and mechanically stuff your things in a bag. If you're not totally on top of it, you'll have 3 plastic bags full of food before you can say "I brought my own". Its still crazy, I have cashiers all the time putting stuff in plastic and then into the canvas bag, then we tell them no and they pull it out and throw the bags away! We always hit the bag yourself lines if possible.